Think the stress of raising children is taking years off your life? Think again. According to a new study, your little ones might be upping your longevity. Here's yet another reason to hug your babies today: According to a new study, they might help you live longer. 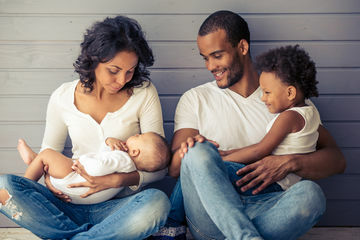 Swedish researchers observed information from over 700,000 men and 725,000 women born between 1911 and 1925, and discovered that study's participants appeared to live longer if they had children, according to findings published in the Journal of Epidemiology and Community Health. The correlation wasn't a huge one: Men who did not have children had a 1.41 percent risk of dying at age 60, and a 1.35 percent chance if they were fathers. Women at this age had a .68 percent risk of dying if they didn't have children as compared to a .52 percent risk if they did. The effect grew as study participants aged: Men were 17.7 percent likely to die at age 90 if they didn't have kids, and had only a 16.2 percent chance if they did have kids. Women without children had an 11.4 percent chance of dying at age 90, while their peers who had children only had a 10.3 percent chance of the same outcome. Of course, the study only surveyed a specific group of people, but it's interesting that people with children had greater longevity across the board. It does sort of make sense that people who have children might live longer: After all, many children become their parents' caretakers at some point, and having kids might give older people more incentive to seek treatment for any health issues that appear. If you're a parent, you likely understand that kids can give your life new meaning, after all. The study doesn't prove cause-and-effect, and even its findings represents a relatively small difference in longevity between those with kids and those without. Still, it provides some interesting food for thought.